Looking for a value-priced alternative to ChaosHost.com? Chaos DesktopSync could be right for you! Do you remember the days of those pre-iPhone Palm Pilots where you just synced your phone with your computer and went out the door to face the day? Our new Chaos DesktopSync program brings those days back! You can avoid annual fees and avoid putting your data on the Internet, too, because Chaos DesktopSync goes direct from your computer to your smartphone. Chaos DesktopSync costs $19.95 and has no annual fees! While your computer can be connected with an ethernet wire instead of Wi-Fi, it needs to be on the same network that your Android or iPhone can connect to with Wi-Fi. Our Chaos mobile apps for Android include Chaos Calendar, Chaos Tasks, Chaos Contacts and Chaos Billing. Each are available for free download from Google's play store. Click here for more details. For iPhone, our first mobile app to use with Chaos DesktopSync is ChaosTasks. This is available from the App Store from Apple. Click here for more info. Finally, the Desktop sync program needs to be installed on the same computer where you run Time & Chaos or Intellect. Make sure your phone is connected via Wi-Fi to same network as your PC. Launch this desktop program to start a sync server and fill out some basic settings the first time. 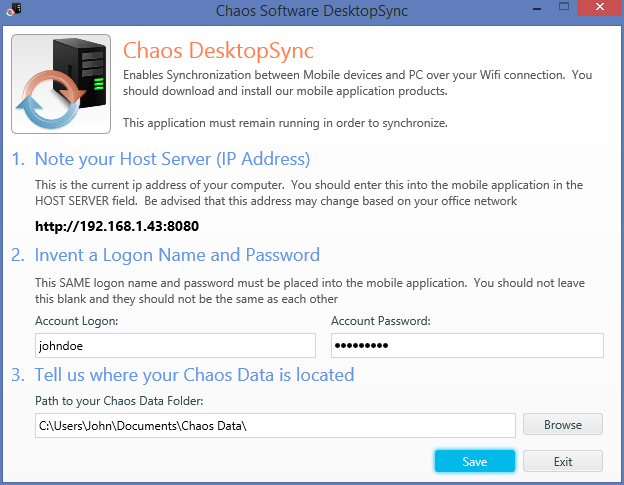 Fill in the server information in the Chaos mobile apps to match the desktop server settings the first time. Do your sync from the mobile apps. Exit the desktop sync server program. Yes! You can download and use Chaos DesktopSync for up to 10 syncs to see how it (and our mobile apps) work. Then come back to our web site and purchase it to continue using it without annual fees! Click here to download Chaos DesktopSync now!